Soar the skies, solve puzzles, play golf or tennis and much more. 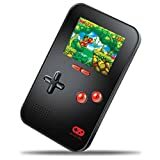 Go Gamer Portable is loaded with 180 fun and easy to play advanced 16 bit video games and 40 educational games! The GoGamer was created in a classic style of the original portable gaming system with a backlit, 2.5” full color LCD screen. Simply power on the system and start playing, anywhere, anytime! Perfect at home, in the car or just about anywhere you can imagine! Fits easily in your pocket, purse, bag or backpack! 220 built-in hires 16 bit retro style games - combination of arcade and educational games for more depth of play. Classic Styling of original portable game system, the GoGamer is perfect for travel. Take your games anywhere - no TV or console needed! Crystal clear 2.5 inch, super bright, full color LCD screen for vibrant full bodied gaming. Games are backlit for use virtually anywhere.